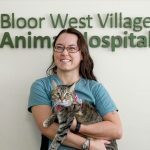 Megan’s journey in the veterinary field started as a veterinary assistant 10 years ago. Her passion for cats and dogs has always been evident in her life. Megan shares her home with Molly the Maltese, and 3 cats. Currently she is enrolled in the veterinary technician program through Penn Foster College. Wen she is not doing school work, she loves to organise and clean, and interact with her family. 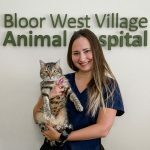 She has been working at Bloor West Village Animal Hospital for a year. She values the team and the great veterinary care they provide.